As part of Jürgen Klinsmann’s coaching staff at the USMNT Matthias Hamman is responsible for the Under 23 team (along with Austrian soccer great Andreas Herzog) and for the scouting of American players performing for clubs across the European continent. We’ve met with the former Bundesliga pro to talk about his job, the tough competition soccer is faced with in the US, and successful youth player development. Coach Hamann, how did you get involved with U.S. Soccer and what are your primary duties? 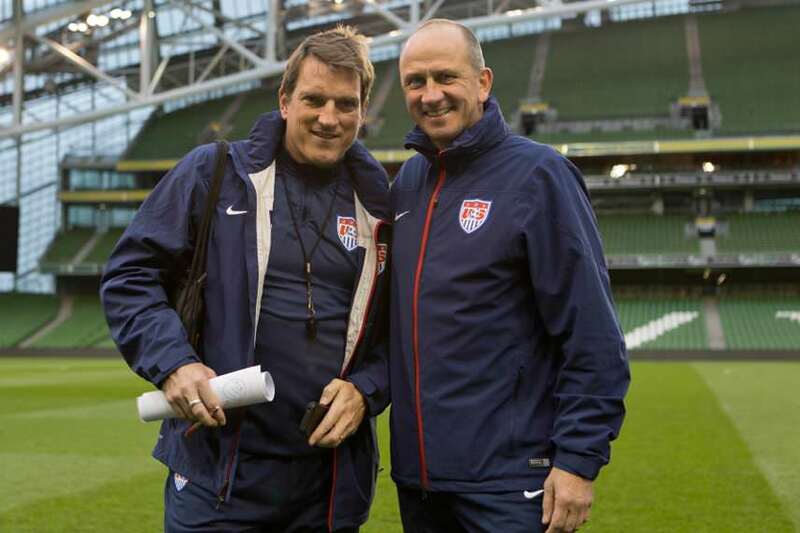 What’s it like working with coach Klinsmann? I started working for the United States Soccer Federation in 2011 shortly after Jürgen was named the national coach. For the first twelve months I exclusively scouted players who could possibly play for the USMNT and who were playing in Europe. The majority of players were either lacing up for EPL teams or Bundesliga clubs. There also were a few who played in France, the Netherlands and Norway. During the first few months I also scouted opposing national teams that we were playing on European soil. This included both video analysis and preparation of our players once they were here. But now some members of our U23 squad are already playing in Europe and even some of our talents from the Under 20, Under 18 and U17 teams have come here. Our job is to look after those players and simultaneously to find new talent, players with dual citizenship, and to tell them what they can expect, how their path in U.S. soccer might shape out. Basically we try to let them know that we want to establish a good connection with them and that we’re there for them. Or we simply invite them to one of our camps. How does this work? How high is the success rate among players with dual citizenship? The players who were with us were absolutely stoked. Jürgen is an accessible coach, a communicator. We don’t have seating orders, super strict rules or any of that stuff. We try to keep everything fair and square. We want the players to give their input and to show their personality. The daily routine is smooth and easy; the players are allowed to use their cell phones and to wear headphones. It’s okay to talk to the coaches during breakfast. We’re not above everyone else. When a player was with one of our physical therapists and he’s a couple of minutes late, we’re not going to chop his head off. That’s just a waste of energy since most of our meals are served as buffet anyway (laughs.) All in all, all of our players want to come back once they’ve been with us. But you have to get in first, of course. What are the criteria for an invite to a camp? How can a player make the team? Coming to camp means joining our team. These are mostly set dates, predetermined by FIFA. When a player comes to a senior level team camp we know he can play. We didn’t invite him just to take a closer look at him, this happened way before that. We much rather want to see how this player handles himself on a social and on a personal level. It’s not uncommon that we look for a specific type of player if we have a need on a certain field position. A lot of times players catch our attention because of the leadership qualities they show on the club level. This is something we all love to see. Jürgen always says that he would love to have ten or eleven skippers on his squad because those players have a certain type of demeanor and personality and that’s exactly what we need. Are there major differences between American and German players? What about differences in the soccer philosophy in general? I wouldn’t say that there’s a major difference on the senior level. Soccer is the same, no matter where you play it, a pitch, two goals, and two teams of 11 players. That’s just the nature of things. There are major differences on the junior levels, though, because German soccer is still a few steps ahead of us when it comes to youth player development. There’s still a lack of structure, but hey, it’s just not that simple in a country as big as the US. We’re still lacking a “base” or a network that allows us to assemble and to scout our young players. Should this network be centralized or decentralized? How can we scout and observe players who might have the potential to play for us? These are the questions that we have to find answers to in the coming years. We already have around 60 to 70 youth academies that are certified by the MLS. Now we need a level of coaching that is state-of-the-art as well. We have to be able to teach our youngest players fundamental technical aspects that they then have to be able to perform under pressure, at the highest speed and in tight spaces. These are standard requirements that are essential in modern soccer. And for that we need coaches that are able to convey these things to their players. We still have a lot of work to do when it comes to these aspects, but this is only natural since we haven’t been in this business for as long as others have. What about structures outside of these academies? What about collegiate soccer? The coaches have to be interconnected and give each other info about good players. This might even by word of mouth. In the best case someone knows the coach of the Under 18 squad and tells him that there’s a player that he should have a closer look at. Then you can start to specifically scout that player and see whether he would fit the team. As you can see, this really isn’t an ideal situation. A club structure like the one in Germany doesn’t exist in the US. Here the boys and girls are being trained by paid coaches that usually are working with about 20 to 25 kids from the neighborhood. They train three times a week and the parents pay 400 to 500 dollars a month for this. Coaches who know each other might organize matches between their respective teams, basically setting up their own league competition. It’s all self-organized. And here lies the problem – the players basically pay for their soccer coaching education, and naturally, this only attracts a certain type of clientele, namely an affluent one. Many parents simply don’t have the money for this type of education. Therefore it’s our goal to establish a structure that allows the best players to play and to practice without having to pay for it. This could either be realized with the help of the association or through scholarships. You mention scholarships, how big of a problem is the competition that American football, basketball, baseball and hockey present? In those sports there’s obviously a well-organized youth player development system in place. Is soccer forced “to wait in line” because of the big four? Well, it’s not all perfect in those sports either. They’re faced with problems, too. Last year the World Cup games of USMNT had better TV ratings than the NBA Playoffs. Thousands of former NFL players have filed lawsuits against the league after suffering repeated concussions throughout their careers. This concussion litigation has forced the NFL to acknowledge that many of its ex-players were suffering from play-related traumatic brain injuries. We’re talking about billions of dollars in settlements here. Who knows if the NFL will ever truly recover from this because less and less parents now allow their kids to play football. While baseball still has its followers, its popularity has declined significantly in the last twenty years, especially among the younger generation. Hockey is a ‘winter sport’ that generates much of its talent from outside the US, primarily from Canada, Russia and Scandinavian countries. I think that right now soccer has a great chance to make a real impact in the US, and you can already see that it is becoming more and more popular. The economic aspect also factors in because many potential sponsors have realized that soccer is truly the only global game. The NFL and the MLB are only popular in the US, hockey only in certain regions of the US and Canada. The NBA is gaining ground on a global perspective but compared to soccer it is still a small fish. Major companies have realized that U.S. Soccer is a global brand and that’s why we’re now being bombarded with sponsorship deals. Now is the time to establish structure and a network to generate and to nurture new talent. We need a structure that enables us to train and develop coaches. 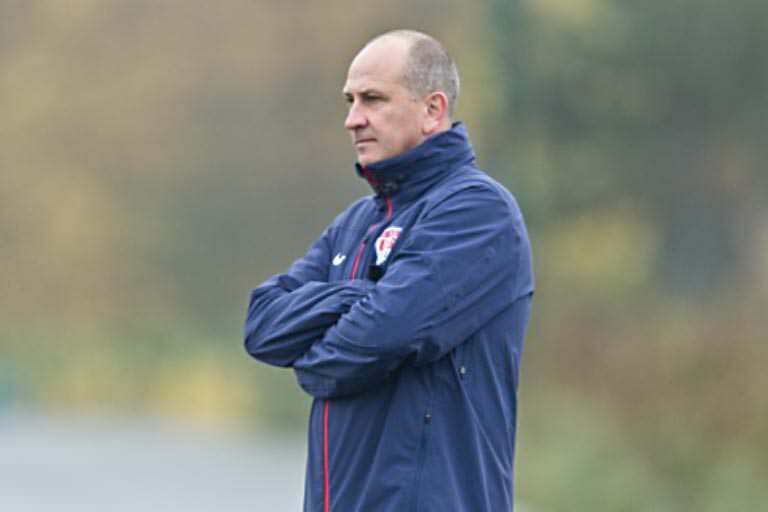 We need a structure that ensures that our talents one day end up with us here at the USMNT. This will certainly take a few more years to realize, but now is the perfect time to lay the foundation. You only have a chance if you believe in ‘team comes first’! What type of player does make it to the top? Or what makes a player the star of his team? Is it a question of talent, hard work or attitude? How can you make the leap from average to great? In my opinion it’s relatively easy to evaluate a player: talent multiplied with determination results in the final product. That’s why a player with less talent has to compensate for this with his attitude and will. He has to work harder and do more in order to be successful. Of course, a highly talented player will also fail to reach to the top if he doesn’t have the right attitude. It’s a matter of finding the right combination between talent and attitude. Soccer is a team game, that’s why a player always has to remember that the team always comes first. Coach Klinsmann always says that when you’re part of a team it’s about giving and not taking. You have to give to the team; you’re only going to get out of it whatever you put into it. You can just “extract” energy from a team, it’s just like in real life. In order to be accepted by a team and to be a leader you have to be willing to give, not just take. Jürgen recently invited former NBA player Steve Nash to speak to our team. Steve talked about his path to the NBA and what he did to make it to the top. Steve is neither exceptionally gifted from a physical standpoint nor was blessed with otherworldly talent. When you see Steve you wouldn’t necessarily think that he’s played in the NBA for 19 seasons, let alone become a two-time MVP and a multiple All-Star. Still he became one of the greatest point guards ever to play the game. To him it was all because of the hard work he put in. He said that he came to every practice an hour early and shot a hundred shots. Same thing after practice. That’s two hundred extra shots every day. Five times a week equals a thousand extra shots. When you project this onto the whole year, that’s 50 000 extra shots. That’s what made him better. That’s the only way it works. Sure, you also have to be lucky, you have to be at the right place at the right time, you have to play for the right team and someone has to discover your talents. This plays a big role as well, of course. But there are a lot of factors that you can influence yourself. Your passion, your attitude and your work ethic have to be at a 100 percent, all the time. Is this a common occurrence that you invite athletes and experts to talk about these things? What about nutritionists or team building experts? Yes, we do have a nutritionist on our staff and we constantly communicate with a number of experts who are specialized in a variety of topics. Jürgen wants as much input as possible. Then we separate the things that could be important and useful for us from the things we can neglect. That’s always the way how Jürgen has done it, even back when he worked in Germany. He would invite extreme athletes who swim hundreds of miles or climb the highest mountains. Something like that. And the bottom line was always that you need to be dedicated to your profession, no matter what you do. You have to give 110 percent in order to get better and you have to willing to do more than everyone else. What do you think makes a coach a great coach? A great coach is able to unite everyone, the ones who give and even the ones who take. A great coach knows how to perfectly integrate each athletic trainer, nutritionist, doctor and physical therapist into his staff. He’s able to convey his soccer philosophy in a way that enables everyone to feel like he or she is part of the team. A great coach knows how to incorporate talents into his squad – giving everyone space while demanding a maximum of discipline. He has to be able to find the right balance in whatever it may be. Think about finding the perfect balance between offense and defense. Defense is about discipline; everyone needs to do his of her job, no matter what it is. On offense it is much more about creativity. Players have to feel challenged but not under- or overwhelmed by their job. They have to feel that they’re part of the team and they have to feel responsible. A great coach also has to be able to communicate. That’s what makes a coach great. What about youth soccer coaches? What are the biggest challenges when it comes to working with youth players? A youth soccer coach has a much tougher job because he even has to be able to motivate his players if they don’t feel like practicing. His main job is to teach his players while keeping them enthusiastic about the game. They have to have fun playing soccer. If your players have fun the technical and tactical aspects will come. Young soccer players are much more receptive to learning new things when they are enthusiastic about it. Game-related drills and small competitive scenarios are ideal and here lies the challenge for the youth coach. Let’s talk some more about youth player development. You have founded a soccer academy in Germany, how often are you there? Where do you lay the focus when you work with youth players? Right now, I’m more focused on the national team, of course. For the last couple of years we’ve narrowed it down to one or two camps a year. The kids are usually between six and fourteen and during that age, I think what’s most important is that the kids enjoy themselves. They should have fun being active; they should have fun playing soccer. Of course we also want to wake their competitive spirit, we want to show the kids how the stars of the game do it and we want to show them what their path in soccer could look like. How has soccer changed compared to when you were playing professionally? What does the future hold for soccer in general? How will it evolve? Nowadays everyone only talks about ball-oriented play and teams are constantly shifting when they are on defense. I think we might have lost something there compared to back when I was playing. This is just twenty years ago but apparently that’s a long time in soccer. In todays game problems are much more likely to be solved within a team concept. It’s not anymore just the one guy that wins the ball, instead you now have one guy pushing the opposing player off to the side where the next defender waits for him, the third guy closes the passing lane and the fourth player maybe wins the ball. It used to be much different back when I was playing; it was much more about one-on-one situations back then. A defender like me had to rely much more on his one-on-one skills. My job was to take the opposing strikers out of the game and to win balls. No matter where the ball was, you always had to be aware of the man you were supposed to mark; you couldn’t rely on a teammate helping you out since he was busy marking his own guy. I think that type of responsibility has been somewhat lost in todays game. Now the responsibilities are shuffled around a bit and in the end no one takes blame. I think that’s a problem, especially in player development. You won’t hear anybody say ‘that was your job, your responsibility’. Nowadays you only have to say that it simply was a chain of events that led to goals, but I think it would be a good idea to give the guys more individual responsibilities again. I also think that the soccer of today is geared too much towards possession of the ball. Sometimes a player passes the ball from the halfway line back to the goalie and then you’re back at square one. That often doesn’t make much sense but that’s just the way it is. What definitely has gotten better is the technical skill set of most players, even when they’re forced to rely on them in tight spaces. I watch around 100 to 120 games a year, and regardless whether those are U17, U19 or U23 games, they tend to look the same. There’s a lot of shifting on defense, you can see ‘the defensive square’ moving around on the pitch while the attacking team tries to get around or through it. Once a team wins the ball, it immediately goes into attack mode while the other team starts to shift their defensive square. From the Under 17 level on you notice that games start to look the same and due to the approach to player development in Germany, the individual talent gets somewhat curtailed along the way. Sure I’m exaggerating a bit when I say that in Germany coaches only want to see their players make low-driven passes over short distances while chip passes with the outside of the boot are prohibited. But once you coaching on the senior level you might one day want that special player that can chip the over the defense with the outside of the boot, because that’s the only way your team can score in a certain situation. We’re limiting our own players in their development, but I think that a change in the way of thinking is bound to come rather sooner than later. Those nifty plays will again be encouraged instead of eliminated. That’s what we try to do here in the US. We want our players to be creative and we want them to display their individuality and their personality. Of course, a player also has to be able to complete a low driven pass over ten feet, but when a players has the personality that we’re looking for I don’t care whether he passes the ball with the inside or the outside of the foot. As long as he feels good about it, I’m fine with it.